We know that you have already spent a good amount of money on buying the mountain bike because you love the ambience of adventure. But, you have to take care of your bike if you want to extract the value of every penny, which you have spent for your bike. Also, if you can maintain your bike regularly, it will enhance the life of your bike, and you can cherish your adventure trips for a very long time. Therefore, we are going to provide you with some tips, which will help you to keep the proper maintenance of your bike. You can also look for necessary mountain bike equipment on Hargroves Cycles discount codes if you want. If you want to keep your bike running for a very long time, it is essential to clean it properly on a regular interval of time. If you neglect this, there is a possibility that it will take a toll on its longevity. Now, let us discuss how to clean your mountain bike. Well, it will be a good option if you use a basic biodegradable cleaner, a towel, a sponge as well as an old toothbrush. Clean all the parts of your bike like the chain, cassette, chainrings, pedals, derailleurs, brakes and seat. Try to avoid loads of water or water jets, while cleaning your mountain bike. To ensure your safety, it is very significant to take care of your bike’s brake very meticulously. Or else, you may have to come across some unwanted accidents, which you don’t want to face. Whenever you are planning for a mountain trip, be sure to check your brakes, while tuning up your bike. While checking your brakes, check the brake pads, which are the small rectangular metallic or rubberised surface that rubs against the disk. By the passage of time, these brake pads wear down and need to be replaced for the sake of your safety. While examining those brakes, use a flashlight to get a clear vision. Wheels are there in the bike to keep your tires in place, which provides the smoothness and stability while riding through the harsh grounds of the mountains. Hence, you have to tune your wheels properly because there will be a consistent contact between the dirt and the tires of your bike. To observe your tires, you must elevate your mountain bike a bit and spin the wheels. If both of your wheels spin freely and smoothly, then you can conclude that your wheels are in proper condition. And if you find any wobbling on the wheels, you can fix your wobbly rim with a spoke range. 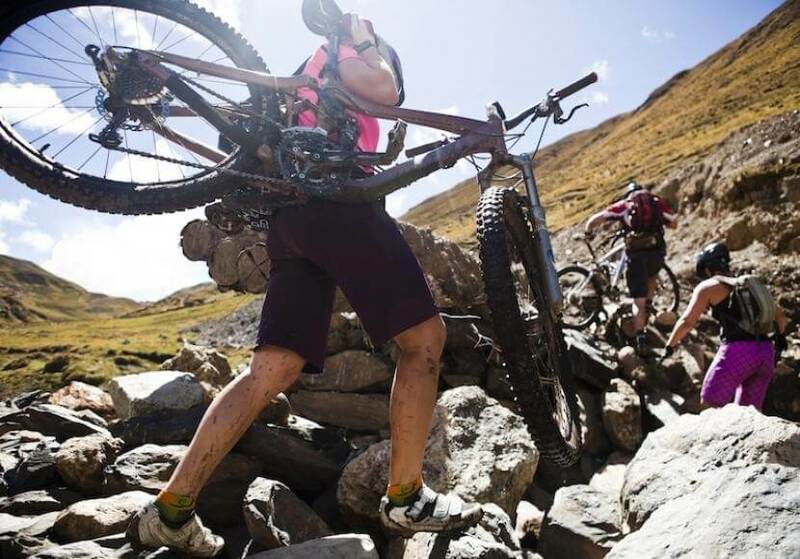 When you are riding through the mountains, you have to ride through several unlikely surfaces like rocks, roots, muds as well as ladder bridges. And for that reason, the tires of the mountain bikes offer you traction with the ground so that you can travel properly through these surfaces. Moreover, they have a flexible cushion which will allow your bike to smooth out on the bumps, which will come on your way. Firstly, check the pressure of your tire according to the structure of the terrain on which you are going to ride. Secondly, scrutinise if there is any crack or split. Also, check whether the tire has excessive wear so that you can replace your tire if necessary. Add oil lubricant to the chain of your bike as well as on the other components of the drive train so that all those components last longer and move with more efficiency. Also, lubricating your bike will protect it from the accumulation of dirt and grime, which will benefit your bike by improving the performances of the moving parts. Make sure to apply lubricant in your chain evenly by rotating the chain very slowly. Likewise, do not forget to lube the moving parts of the derailleur, any exposed cable wire; and also to the pivot point of the brake levers. And if you find out that you have used excessive oil for the purpose of lubrication, make sure to wipe it off, especially on the chains. Use a clean and dry rag to wipe the excessive oil. Well, these are some of the tips, which you can follow to increase the age of your mountain bike so that it can stay in its optimal state for a very long time. Thus, follow these tips to get the best results.